I laughed when I first saw it. 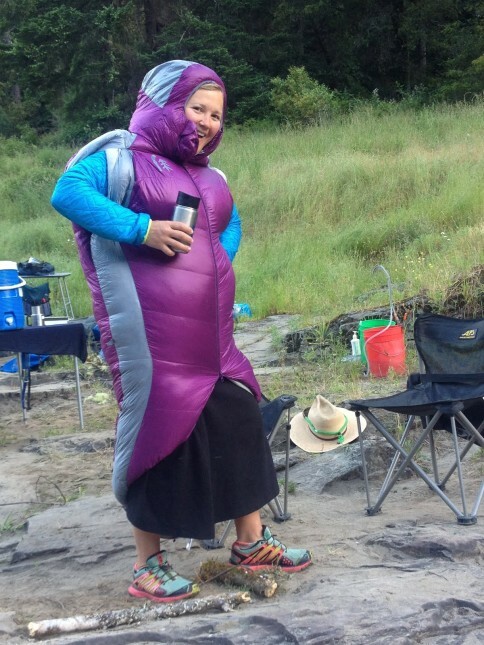 The DriDown Mobile Mummy 800 3-Season sleeping bag by Sierra Designs is designed differently than “normal” sleeping bags. It reminded me of a fellow river guide who had something similar, but more like a sleeping ‘suit,’ which happened to be bright green. We called him Gumby when he wore it. The Mobile Mummy has two slots near the shoulders so you can be cozy in the sleeping bag, while still having full use of your arms on the outside. Instead of a side zipper, there is a 58” center zipper that allows you to stick out your feet while still wearing the bag. 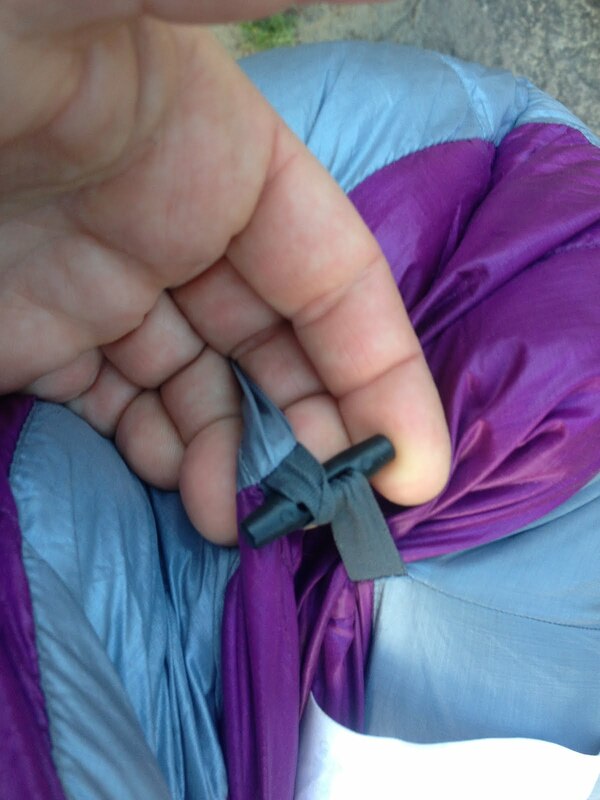 Two toggles on the back also latch a stowable footbox to the rear, providing free and clear room to walk around without dragging the bag on the ground. Yes, it keeps you toasty warm. It’s pretty cool to be able to use your arms while wearing the bag. You most definitely look like a turtle while walking around in the bag. In all seriousness though, the “garment-style” bag worked well on the river. I didn’t worry about dew on the bag in the morning, knowing that the down had been treated to stay ten times drier than untreated down. I liked that I was able to sleep on my side without having the bag bunch up on me. And probably my favorite perk is that I could be all zipped up in the bag, yet have my arms out in front of me holding a book. When I put my arms back in to sleep, I didn’t feel any extra coldness around these slots, which was an initial concern I had. After inspection, I saw that the lining is reinforced both around the arm slots and the center zipper to keep warmth in. The hood was snug around my head when I was horizontal, but I didn’t need to tighten any cords, it just naturally fit well. It was quite fluffy and full, which was comfortable when I was lying down, but a slight pain when I stood up. Everyone agreed that the arm slots were super useful and cozy, but the stowable footbox latches were a design flaw. When you’re in the sleeping bag, it’s hard to slip the small loop over the plastic latch. The best way we found to latch the footbox was to have a buddy do it for you. Arm slots are fantastic–useful and comfortable. No worry over dew buildup thanks to DriDown technology. Making coffee while still in your sleeping bag is pretty awesome. Latches for footbox are hard to tie while the wearing bag. Women’s-specific bag fits up to 5’8”. I’m 5’7”, so I found myself wishing I had a few more inches in bag length. For the warmth, the mobility and the laugh factor, the Mobile Mummy 800 3-Season is a good fit for rafters and campers alike (especially if your least favorite part of the day is getting out of your sleeping bag to make coffee). Ladies, skip the women’s bag and get added space and comfort with the standard “men’s” bag. It’s less expensive and a few ounces lighter too. Bonus!